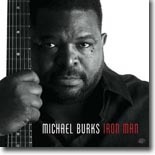 Michael Burks continues to grow as an artist as shown on his latest Alligator release, Iron Man. It's this month's Pick Hit. Carolyn Wonderland, a woman with a voice as big as Texas, presents a very diverse blues/rock album, Miss Understood, as this month's Surprise hit. Three Days Walkin', a fine CD from the very obscure Chicago harmonica player Fomot RaSun, is highlighted in this month's Flashback feature. Our What's New section features new releases from Janiva Magness, Bonnie Bramlett, Danny Brooks, Davis Coen, Kenny Blues Boss Wayne, Homemade Jamz Blues Band, Pinetop Perkins, Dave Specter, Watermelon Slim and more.